Drew Phillips’ double ensured Barton Rovers maintained their stunning away form with a 2-1 win at Kidlington on Saturday. Lee Close returned to partner skipper Paul Andrews at centre half with Gary Jones reverting to left back. Kidlington were first to show through centre forward Darius Browne, although Victor Osubu and Jimmy Hartley were lively in the wide areas for Rovers. The nearest either side got to an opener in the first half was when Hartley blasted over from a good position after 39 minutes. A much busier start to the second half saw visiting keeper Gary Malone in action saving from Lewis Coyle. Two minutes in a reckless late challenge on Rovers right-back Matt Hall by Kidlington’s Declan Benjamin led to some ugly scenes and Hall being stretchered off with what looked a bad injury. Benjamin was somewhat fortunate to just see yellow, but this incident seemed to spark Rovers into action. From the resulting free-kick, Steph Bailey sent in a cross which Phillips rose to nod home. Chances followed quickly for both Osubu and Connor Vincent but they were wasted. 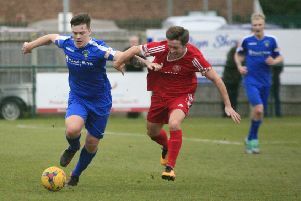 Kidlington’s Marvin Martin saw his hopes of an equaliser denied by Malone as the visitors had breathing space with six minutes to go, Phillips breaking free from halfway to finish coolly. There was still time for Kidlington’s substitute Piers McGlyn to score a consolation as Rovers held out during a substantial period of injury time. Rovers are not in action this weekend.